Since then, the magazine has built upon the themes of exploration, discovery and documentation. 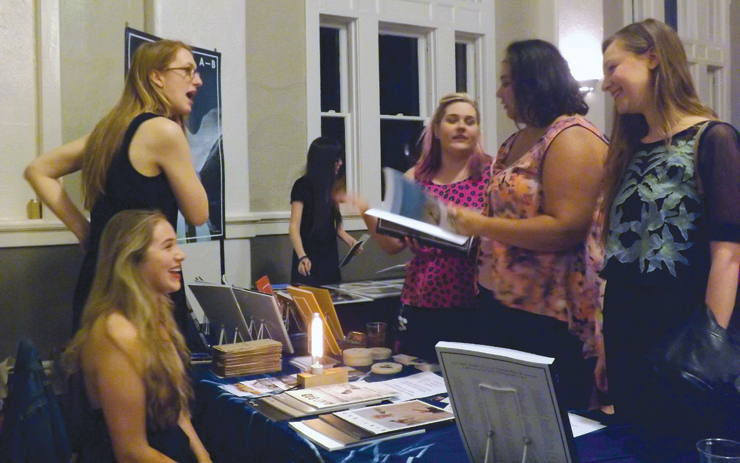 A launch party for the latest and first bi-annual issue of Ain’t Bad (aka A-B) was held Friday night at the American Legion Post No. 135. The magazine’s latest issue illustrates the growth of the publication. Not only is this issue larger, but it also has a focus on fine art photography. A-B started as an online site founded by SCAD students who were about to graduate. Two of the original founders, Carson Sanders and Taylor Curry, are still with the magazine. “We wanted to take the critique out of the classroom,” Sanders said. The group was looking for a way to continue reviewing each other’s work after they graduated. They later decided that reviewing physical prints of their photographs was better than looking at them onscreen. As a result, they created the first issue of Ain’t Bad which featured work mostly by SCAD students. A successful Kickstarter campaign allowed the magazine to publish 2 to 3 issues per year. Now Ain’t Bad will publish 2 thicker issues per year featuring more artists and writers than in the past. Sanders said they wanted a magazine that would take a reader longer than 15 minutes to read through. They wanted something that a reader could spend more time with, something that a reader could come back to over time. The magazine’s name came from the southern slang term. Sanders wrote in an email that many of their friends were saying things like “that work ain’t bad” as a compliment. “We thought it was appropriate to give our Savannah based publication a name with a Southern ring to it,” he wrote. The art in the latest issue of Ain’t Bad includes a mix of film and digital photography. Most people who submit work are seeking Bachelor of Fine Art degrees, but anyone interested in fine art and photography can submit work. Sanders and Curry plan to make Ain’t Bad a nonprofit. They want to help artists publish their own monographs and possibly own a gallery. Copies of their new issue are available on aintbadmagazine.com. Books from various artists are also available on the site.